Available in a 2 pack, this classic white v-neck t-shirt makes the perfect undershirt for men. It is a 50% cotton/50% polyester blend that lasts twice as long as all cotton. 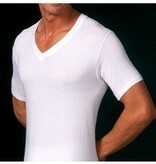 The jersey knit, sewn in neckband, and taped shoulders and neck make for longer lasting comfort.